Before anyone misinterprets the title, it’s actually cheers to the city – not the football club alright? 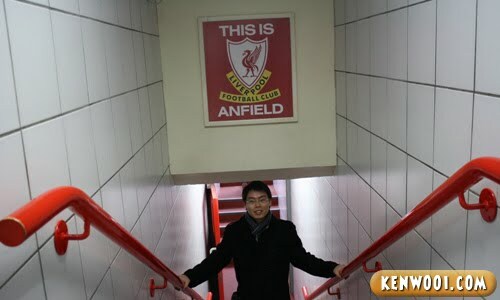 But admittedly, I did go for the stadium tour at Anfield – however that’s gonna be on another entry. Here’s one interesting fact – when you thank someone in Liverpool, say “Cheers” instead of “Thank you”. The Liverpudlians rarely say “Thank you”. 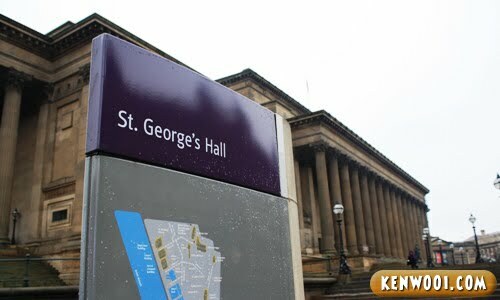 Okay, so I was at Liverpool as well – where its famous icon is a lamb. A lamb called Super Lamb Banana. What a name right? Actually, there are many of them – in different versions. 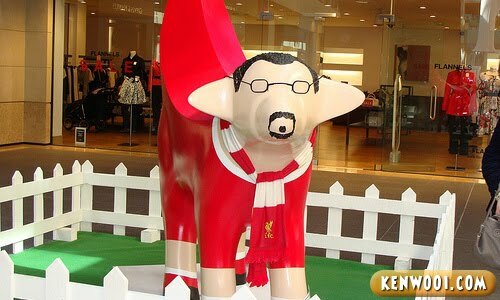 There is one with beard and glasses drawn to depict Liverpool Football Club’s manager. They call it Baa-nitez! Baaaaa! Old cases stacked together, forming a pile of… junks? More of a decoration I guess. And among that pile, there is a old Mac case as well. 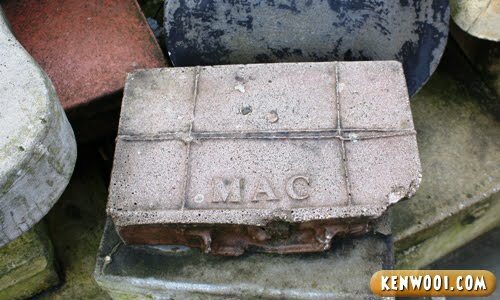 Is that what they used to keep Macbooks in the olden days? I don’t know lah. 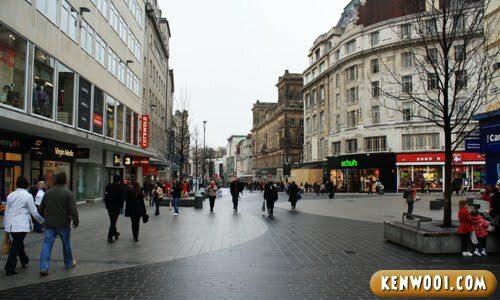 Anyway, here are some pictures taken of certain places in Liverpool. The Liverpool Cathedral. It’s really one huge structure and it can be seen from almost every part of the city. Unfortunately there was a thick fog when I was around. Here’s another view of the cathedral from afar. So distinctive. Besides that cathedral, I also visited another one as well. 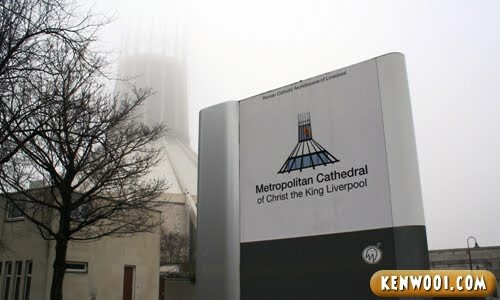 Although the Metropolitan Cathedral (kinda blurred by the fog) is not as massive as Liverpool Cathedral, its internal architecture is really unique. Very beautifully designed, I must say. Perhaps it’s a more modern one. 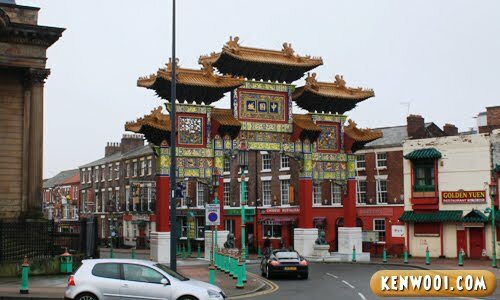 Liverpool’s very own China Town. Unlike having dim sums at Manchester’s China Town, I didn’t try any Chinese cuisine here. 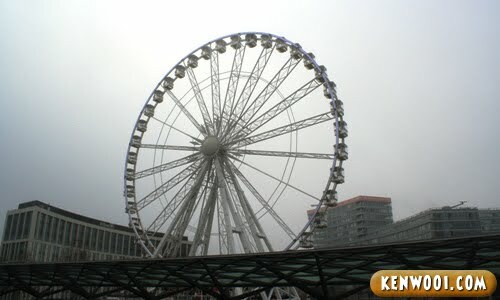 The Liverpool Eye as well. 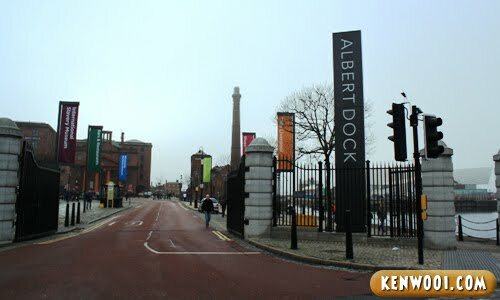 Albert Dock is probably one of the famous sites on Liverpool. Initially I thought it was just an ordinary dock where ships and boats can only be seen. In fact, there are many attractions located around that area. Museums and exhibitions in particular. 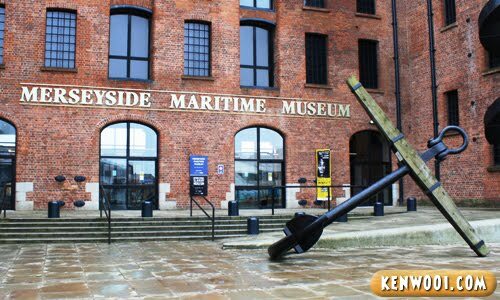 One example is the Merseyside Maritime Museum. In there, you’ll learn about different types of ships and how they are built. There’s a section dedicated specially for the famous Titanic too. Then, the Beatles Story Exhibition. I didn’t enter it though – not really a Beatles fan. 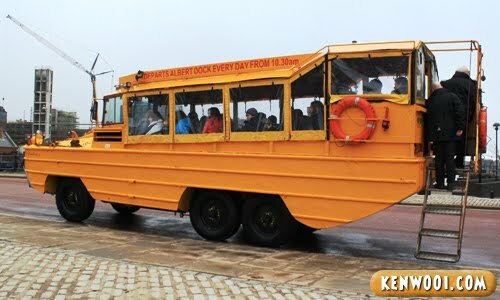 There’s also a ride called Yellow Duck Marine that departs from Albert Dock every morning. The ride uses a special vehicle that can operate both on land and water. 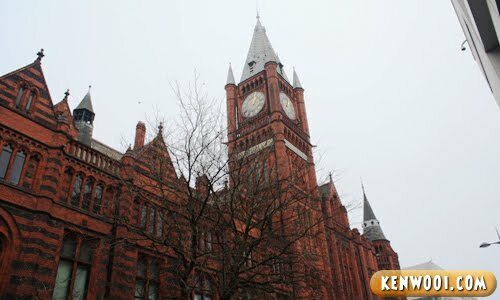 Besides Albert Dock, I also managed to see the University of Liverpool. This is the main building of the university. Doesn’t look like one right? Anyway, moving around the city is quite convenient – since it isn’t that big. There are pedestrian pathways located almost everywhere. If I’m not wrong, it takes about 10 to 15 minutes walk from different locations. Therefore, there’s no need for any public transportation in Liverpool city. Oh yeah, as I was exploring the city, I saw some thing very familiar. Something that resembles a phrase widely used in Malaysia. So Dato’ Seri Najib Razak, was 1Malaysia inspired by Liverpool? It looked like a great city! 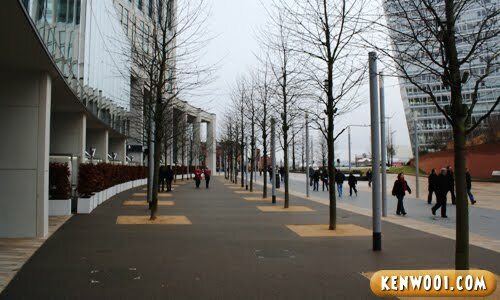 First I thought it will be another football club post, luckily i am wrong.. Look so nice, and their street so clean.. The super lamb banana very funny lorh, you din ride on it? No the inspiration of 1Malaysia comes from 1Utama! haha!! 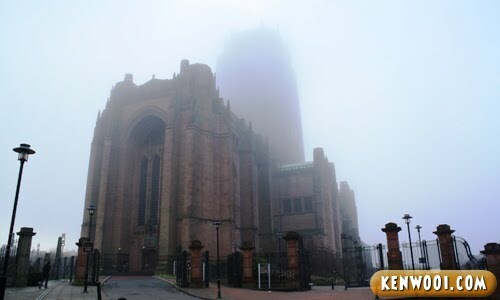 I like the photos of the cathedral and the fog surrounding it. Nice!! Wow…you even go to Liverpool! :D So did you meet Steven Gerrard? i like the banana lamb!cute! 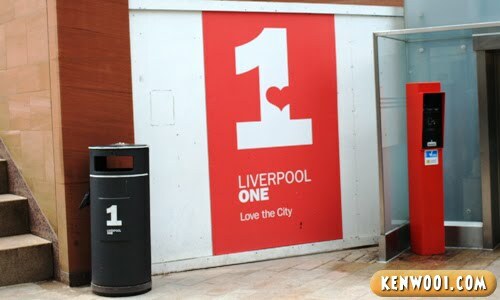 I’m arsenal fans not Liverpool but still jealous with your journey, Ken..
Is the city really that clean or it just looks clean at the angle you snapped the pictures? Surprised to see that there’s a Chinatown there. The entrance (is it??) looks very nice. i think everyone in the uk say ‘cheers’ by way of ‘thank you’…n i hate it, dunno why..
hey, y u did’t eat at liverpool’s china town???.. Woohoohohohoho! 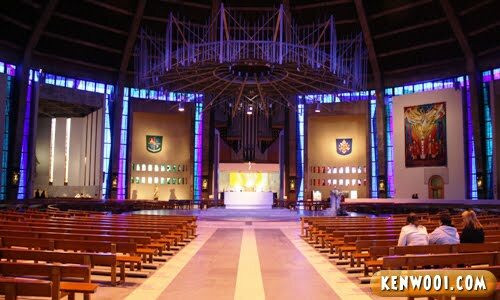 The Cathedral’s interior is superrrrr cool. nooo!!! 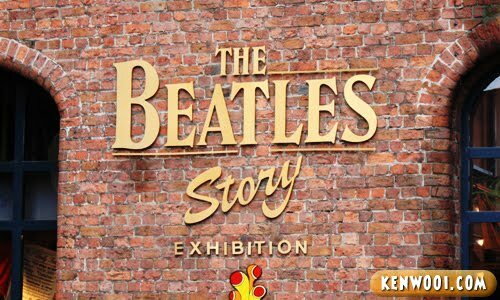 you should enter the beatles story exhibition! On the pile of suitcases statue, I never did notice there’s 1 labelled Mac *_* And the Cathedral really big yes. I asked my friend to take a photo of me with the whole thing, and until today i am still amazed everytime i see the size of that building compare to me in the photo. How come u walk alone when Gunners motto are ‘You will never walk alone’…ha..ha…ha..ha. Really a nice & history place…! Honestly I’m quite curious to know how many UK trip post you gonna have? Hahaha. LOL. You really good in separating your trips into different posts to prevent you got nothing to write? LOL. Cool writer! At first i thought you’re gonna blog about the football club so i didnt even bother to read. Guess I’m wrong after all. wah bestnye pg liverpool. huhu..
siap pegi field of anfield rd..
People in the uk generally say cheers as thank you,not just in liverpool. 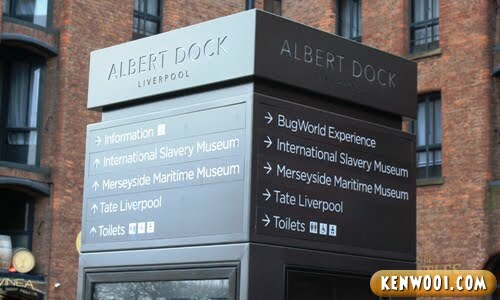 any recommendation for liverpool 1 day trip??? I heard the cathedrals are free entrance..
Super Lamb Baaaaanana ? Really, what a name!! It actually looks good though. Brings back wonderful memories with my friend, Cynthia. It was a day trip from Wigan to Liverpool. Enjoyed what I saw – the maritime museum is interesting. Took pics at where the Beatles used to jam. Liverpool seems to be an interesting place to visit. How’s the stadium compares to Old Trafford? I like you UK posts! =D Hope I can go there one day. UK is very beautiful, from the scenery to the buildings. wow man….you went to every stadium izzit?? did u go to the craven cottage too?? perhaps i can considering migrate there. Bila la saya nak g sana??? Love the place.. And how’s the people? Are they friendly to Asians? Say, the wet might not be so much fun..
I’m not a big fan of Liverpool. :-P Errrr, think Liverpool, think the Beatles..
how long in advance did u have to book to get tics for the stadium tour… i recall visiting and being told it was full for like ages until i can’t remember – that was a while back so all we did was go round the trophy gallery/souvenir shop. I never ate at the Chinatown in Liverpool either, all the times I visited it. But it always struck me as nicer than the Manchester Chinatown, even if it’s a bit smaller. The one in Manchester always struck me as a bit dingy. It’s a really nice place. LOL. The more I read your blog, the more I feel like wanna save more money and travel around the world some day. HAHA!! The more I read your blog, the more I feel like wanna save more money and travel around the world some day. HAHA!! I almost choked when I saw the Super Lamb Banana; it’s so damn hilarious. Your posts almost made me wanna go on a vacation again too. only been to london….im so going to revisit one day! Can u do a japan travel blog??? I SO want to go to England!!!! they just lost the BIG GAME yesterday and your post title really mis-leaded me to think that you hate Liverpool so much meh?! HAHA! Kenwooi… Remember, in soccer terms… Once a Liverpoolian always a Liverpoolian… no matter what.. Hail to the Reds, King of Europe, Darling of England, Pride of Merseyside!!!! You will never walk alone!!! I’m feeling so nostalgic now. 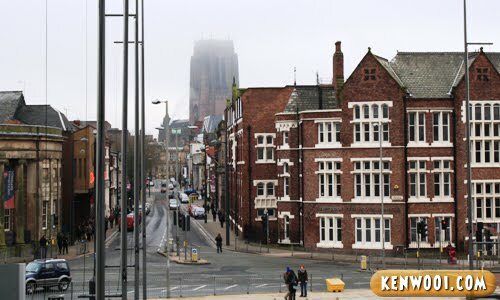 I studied in Liverpool for one summer, and I absolutely loved the city. Thanks for uploading those photos. 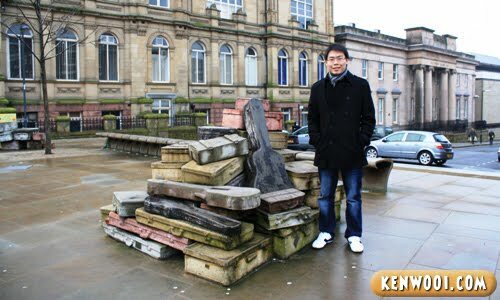 I remember having classes near that sculpture of the suitcases, and the Lambanana used to be right outside my hostel. Nice blog. Love it. Cheers! Normally Liverpool people don’t say thank you but they said “TAR” instead.. They don’t really say cheers. They normally call you lad, mate or love for ladies. Just FYI :) CheerS!